The Baddest Beach Carts In The Sand! We consider to have the ultimate beach carts on the market. We speak highly of our own beach carts, but it’s for a reason. It’s not that we just want to talk about our beach carts being the best, we openly put them up against any other beach cart on the market to compare which is really the best. I get it, talk is cheap and anyone can just say their product is the best. So if you find a beach cart that’s better, let us know. We pride our brand on customer service, innovative products and making your camping or beach experience more enjoyable. So why do we think our beach carts are the best? Had balloon wheels so it would roll easy in soft sand. Big enough to hold all our beach gear. Could mount the umbrella to the beach cart. Well, couldn’t find a beach cart that matched my criteria. I have over 20 years of digital media experience, so I know a thing or two on searching the internet. You could find beach carts that matched 2 out of the 3 but not something that would fit in our fifth wheel or wasn’t $1000+ and looked like a tank. I ended up buying a fishing cart and modified it to do everything I wanted. Talk about a head turner at the beach. I really don’t know many people that enjoy the level of effort it takes to get your umbrella down into the sand and not blow over on a windy day. Call me lazy but I enjoy, enjoying the beach and not the struggle of getting all your stuff to the spot on the beach, getting your umbrella to stay up and then doing it all over once you want to head back. I packed the cart full, pulled it with one hand through the first 20′ of soft sand. Pulled everything out. Opened the umbrella. Sat down to drink a cold one while my wife enjoyed the sun. My two young daughters played on the beach. We were the envy on the beach, not because of my good looks, but because we had the ultimate beach cart. When I got back from the beach in 2015, I did more research. Still, no real beach cart that did everything I wanted, was able to be transported easily and wasn’t over $1,000. So I started sourcing companies to make The Original Beach Cart XL with everything I wanted, and the ability to add accessories later. 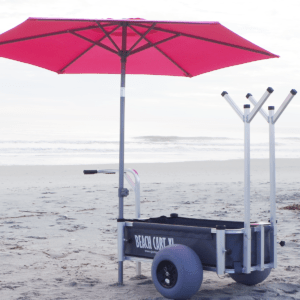 Shop The Ultimate Beach Carts! In 2019, we’re adding the Folding Beach Cart XL to our lineup. Our Beach Cart XL isn’t practical for everyone – it’s a little pricey and doesn’t fit in everyone’s vehicle. So we are manufacturing a folding beach cart with either 9″ or 13″ balloon wheels (the magic ingredient in soft sand).